Spring is coming in like a turtle, steady and slow. Local fresh herbs still a dream, alas; tonight’s ravioli was sans the sage, finished with nutmeg and grated parmesan. Fresh (real) ricotta is not only easy to make, it can be found at many specialty grocers. If you are short on time or cannot find any, use store bought whole milk ricotta (i.e. Stella), straining it for an hour before using. Ravioli can be made ahead of the meal, covered and refrigerated for up to 4 hours. 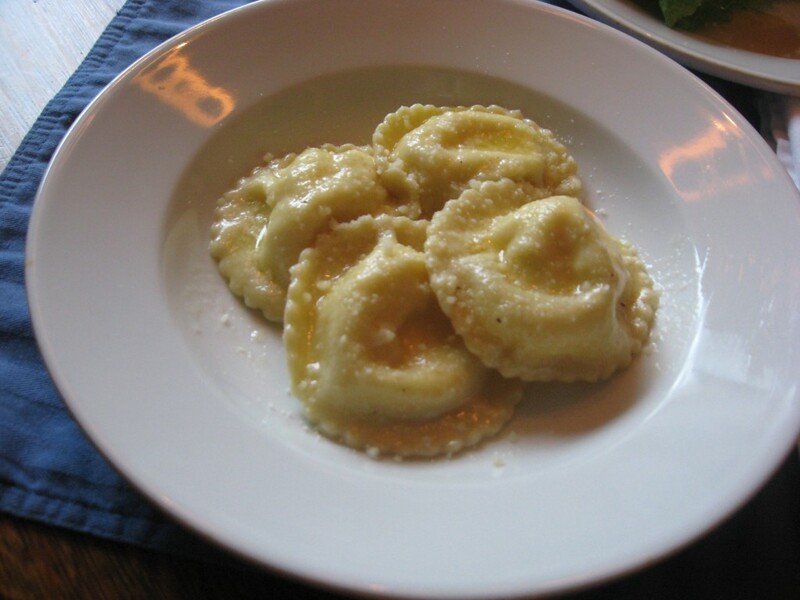 Using a dusting of extra flour or semolina flour will help keep the individual raviolis from sticking to one another. Note: Depending on your location (humidity, altitude, etc…) you may need to add water and/or more flour in order to bring the dough together. Either using the flour well technique, or a food processor, mix together the 2 eggs with flour, oil, and any necessary water. Mix and knead until smooth, let rest, covered, for 30 minutes before rolling out. Meanwhile, in a bowl add ricotta, mozzarella, ½ cup parmesan, nutmeg, ½ tsp. fresh ground black pepper, and one egg (whisk the egg in a separate bowl before adding), mix very gently until just incorporated. Set aside. In a large pot, heat water over high heat for pasta. Roll out pasta using a pasta machine (I love my Atlas, but there are several machines on the market. Cut sheets about 12” long (most machines will roll it out about 4” wide). In a small ramekin/bowl, whisk last egg and set aside. In a large sauté/skillet over medium low heat, add butter and begin to melt it. Once butter is melted, add sage leaves and cook over medium low heat. The butter will begin to foam slightly; the leaves will cook and begin to turn a darker green color. Do not burn the sage leaves or butter. It will be finished when butter is slightly brown and sage leaves slightly crisp. While butter and sage is cooking, begin to make ravioli. Pasta dough should not sit out too long or will dry out. Layout half the sheets on a large counter space. Using either two spoons or a tbl. measure, place 1 heaping tablespoons of the cheese filling onto pasta, spacing about 2” between each (on either side). Most pasta is rolled out wide enough to accommodate 2 rows of ravioli on sheet. Using a pastry brush, brush the egg wash around each of the mounds of cheese. Carefully place the second set of sheets of pasta on top, pressing down gently around the mounds – but not on top. Using either a knife or pasta cutter/crimper, cut down the middle then across the sheets to form the individual raviolis. You should be able to get 16-24 ravioli. Once ready to assemble the dish, carefully add ravioli to boiling salted water. Cook for 2-3 minutes at most. Remove with a wide mesh spoon and add to sage butter. Toss to coat well. To plate, serve ravioli with the fried sage leaves, brown butter, and top with the remaining parmesan cheese.